Sebuah pesawat Hawker Tempest V pengeluaran akhir yang diterbangkan oleh Bill Humble. Hawker Tempest adalah sebuah pesawat pejuang buatan Britain yang digunakan oleh Tentera Udara Diraja semasa Perang Dunia II. Tempest adalah sebuah terbitan yang dipertingkatkan dari pesawat Hawker Typhoon, dan merupakan salah satu pesawat pejuang paling berkuasa yang digunakan di dalam perang ini. Beamont, Roland. My Part of the Sky. London, UK: Patrick Stephens, 1989. ISBN 1-85260-079-9. Beamont, Roland. Tempest over Europe. London, UK: Airlife, 1994. ISBN 1-85310-452-3. Bentley, Arthur L. "Hawker Tempest Article and Drawings." Scale Models Magazine Vol. 4, No 2. February 1973. Hemel Hempstead, Hertfordshire, UK. Bridgman, Leonard (ed.). "The Hawker Tempest." Jane's Fighting Aircraft of World War II. London: Studio, 1946. ISBN 1-85170-493-0. Brown, Charles E. Camera Above the Clouds Volume 1. Shrewsbury, UK: Airlife Publishing, 1988. ISBN 0-906393-31-0. Buttler, Tony. British Secret Projects: Fighters and Bombers 1935-1950. Hersham, UK: Midland, 2004. ISBN 1-85780-179-2. Clostermann, Pierre. The Big Show. London, UK: Chatto & Windus Ltd in association with William Heinemann Ltd., 1953. No ISBN. Darling, Kev. Hawker Typhoon, Tempest and Sea Fury. Ramsgate, Marlborough, Wiltshire, UK: The Crowood Press Ltd., 2003. ISBN 1-86126-620-0. Halliday, Hugh A. Typhoon and Tempest: the Canadian Story. Charlottesville, Virginia: Howell Press, 2000. ISBN 0-921022-06-9. Mason, Francis K. Hawker Aircraft Since 1920 (3rd revised edition). London: Putnam, 1991. ISBN 0-85177-839-9. Mason, Francis K. The Hawker Typhoon and Tempest. Bourne End, Buckinghamshire, UK: Aston Publications, 1988. ISBN 0-946627-19-3. Ovčáčík, Michal and Karel Susa. Hawker Tempest: MK I,V,II,VI,TT Mks.5,6. Prague, Czech Republic: 4+ Publications, 2000. ISBN 80-902559-2-2. Rawlings, John D. R. Fighter Squadrons of the RAF and their Aircraft. Somerton, UK: Crécy Books, 1993. ISBN 0-947554-24-6. Reed, Arthur and Roland Beamont. Typhoon and Tempest at War. Shepperton, Surrey, UK: Ian Allan, 1974. ISBN 0-7110-0542-7. Scutts, Jerry. Typhoon/Tempest in Action (Aircraft in Action series, No. 102). Carrollton, Texas: Squadron/Signal Publications, 1990. ISBN 0-89744-723-2. Shores, Christopher. Ground Attack Aircraft of World War Two. London: Macdonald and Jane's, 1977. ISBN 0-356-08338-1. Tempest at War DVD, IWM Footage. Thomas, Chris and Christopher Shores. The Typhoon and Tempest Story. London: Arms and Armour Press, 1988. ISBN 0-85368-878-6. Watkins, David and Phil Listemann. No. 501 (County of Gloucester) Squadron 1939-1945: Hurricane, Spitfire, Tempest. Boé Cedex, France: Graphic Sud, 2007. ISBN 978-2-9526381-3-5. "Napier Flight Development." (Article and Images)Flight No. 1961, Volume L, 25 July 1946. Shores, Christopher and Chris Thomas. Second Tactical Air Force Volume One. Spartan to Normandy, June 1943 to June 1944. Hersham, Surrey, UK: Ian Allan Publishing Ltd., 2004. ISBN 1-903223-40-7. Shores, Christopher and Chris Thomas. Second Tactical Air Force Volume Two. Breakout to Bodenplatte, July 1944 to January 1945. Hersham, Surrey, UK: Ian Allan Publishing Ltd., 2005. ISBN 1-903223-41-5. Shores, Christopher and Chris, Thomas. Second Tactical Air Force Volume Three. From the Rhine to Victory, January to May 1945. Hersham, Surrey, UK: Ian Allan Publishing Ltd., 2006. ISBN 1-903223-60-1. 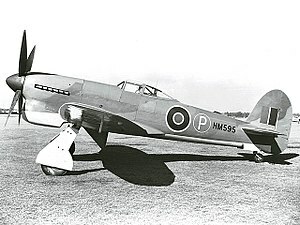 Wikimedia Commons mempunyai media berkaitan: Hawker Tempest. Laman ini diubah buat kali terakhir pada 22:11, 24 Mac 2018.